The incidence and mortality rates for most cancers are increasing in emerging countries, mainly due to the adoption of unhealthy Western lifestyles such as smoking, physical inactivity, and poor diet. In particular, therapies for hematological (blood) cancers are leading growth in the global market for hematological drugs and diagnostics, according to BCC Research. This market includes three segments: hematological disorders (for example, anemia), hematological cancers, and instruments and reagents. The global market for hematological drugs and diagnostics is expected to grow from nearly $86.5 billion in 2015 to $124.3 billion in 2020 at a five-year compound annual growth rate (CAGR) of 7.5%. Hematological disorders, the largest segment, is expected to reach $57.3 billion and $80.0 billion in 2015 and 2020, respectively, reflecting a five-year CAGR of 6.9%. The expected decline in the annual cost of treating blood disorders and the patent expirations of key drugs should slow market growth of this segment. Hematological cancers, the fastest-growing segment, should increase from approximately $24.0 billion in 2015 to $38.2 billion in 2020, with a five-year CAGR of 9.7%. The diagnostic and treatment market for hematological cancers (i.e., cancers of the blood, bone marrow, and lymphatic systems) will be driven by the growing population of individuals suffering from leukemia, along with novel drugs that offer improved efficacy. Leukemia remains an area with limited treatment options and a high unmet need for early diagnosis. 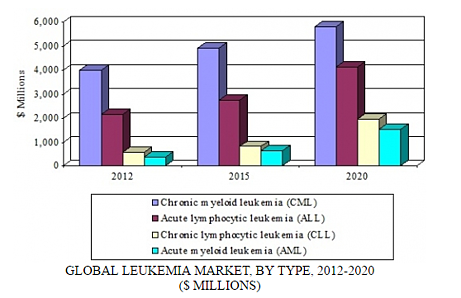 The global leukemia market is dominated by chronic myeloid leukemia (CML), followed by acute lymphocytic leukemia (ALL), chronic lymphocytic leukemia (CLL), and acute myeloid leukemia (AML). In a first for the disease, there is now an FDA-approved companion diagnostic and drug pairing intended to treat a specific population of patients with leukemia. In April, the FDA granted approval of Abbott Molecular’s Vysis CLL FISH probe kit, which detects the 17p gene deletion in patients with CLL, and a drug intended to treat such populations, AbbVie’s Venclexta. The 17p deletion is linked to a lower response rate to chemotherapy and is more prevalent in patients with relapsing or refractory CLL. Venclexta is approved for those CLL patients with the 17p deletion who have received at least one prior therapy. According to statistics from the American Cancer Society, there are expected to be approximately 19,000 new cases of CLL in the United States in 2016, mainly in adults older than 55. AML IS NOT JUST ONE DISEASE? Combos such as Abbott/AbbVie’s are vitally important. New genetic findings reveal that the hematological cancer known as AML is not one disease but at least 11 different types. Scientists say the discovery could aid diagnosis and lead to new treatments that are geared toward fighting the different types of the disease. Previous research into the genetics of the disease suggested that AML could be separated into a number of different subgroups. But nearly half of the patients with AML who were involved in the new research would not have fallen into any of them. Scientists say they have now produced the most definitive classification system yet for the disease, with 84% of patients involved in the study falling into one or more of 11 subgroups, eight of which had previously been proposed. In the market for hematology instruments, competition is based on several factors that include price; product innovation; demand; and service, distribution, sales, and promotion strategies. Many patients prefer home monitoring devices, which has led to a decline in the demand for standalone coagulation analyzers. However, near-patient testing, blood-thinning therapeutics, and clot removal techniques continue to drive the market for coagulation analyzers. A new study by BCC Research, Drugs and Diagnostics for Hematological Disorders: Global Markets, analyzes the instruments, reagents, testing, screening, and therapeutic markets for hematological disorders. The regulatory environment, new technologies, incidences of hematological disorders and cancers, market projections, and market share are also addressed. Global market drivers and trends, with data from 2015 and projections of CAGRs through 2020, are provided.